Spunky and outspoken Eve Appel moves from Connecticut to rural Florida intent on starting a new life, free of drama, and more importantly, her soon-to-be ex-husband. The rural Florida town of Sabal Bay, situated only an hour from West Palm, proves to be the perfect spot for her consignment store. Thanks to the recent economic downturn, Florida’s society matrons need a place to discreetly sell their stuff and pick up expensive-looking bargains. But Eve’s life, and her business with it, is turned upside down when a wealthy customer is found stabbed to death in a fitting room. As accusations fly and business slows, Eve decides to take things into her own hands. With the help of an unlikely bunch of friends—including her estranged ex, her best friend, a handsome private eye, and a charming mafia don—she struggles to find answers and save lives. Through a maze of distorted half-truths, dramatic cover-ups, and unrequited passions, Eve learns just how far the wealthy will go to regain what they have lost. 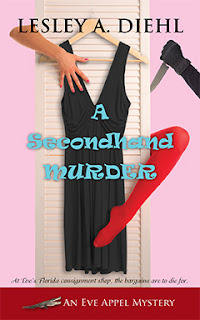 A Secondhand Murder is Book 1 of the Eve Appel Mysteries Series. This book has everything in it from a divorce that was never finalized to a murder of someone that Eve doesn't really get along with, to a mysterious P.I. that has eyes for Eve. When she and her friend Madeline open their high end consignment store, it's a huge event that ends with a murder. There were so many characters that I really enjoyed everyone from Eve's crazy ex-husband Jerry to Alex the Private Investigator to her grandmother and grandfather. They all had their quirks that I loved. Definitely a great new refreshing series that I can't wait to read more when the author writes more! Now for the giveaway. I have on ebook copy to giveaway in the comments below with your email address answer my one question which is Do you have a cozy mystery favorite which ones is yours? And I will pick on random winner. This contest is open to USA residents only. Sounds like a really fun mystery. Quirky characters typically make for a more interesting read. Thanks for sharing your review with us.